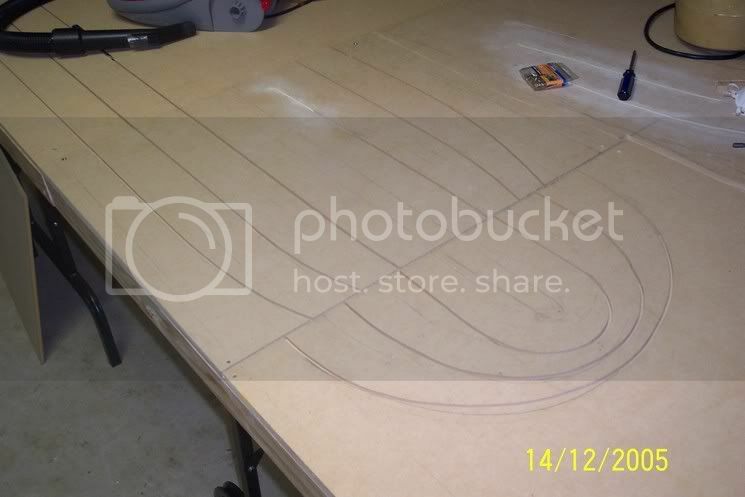 Here are some details of my first routed layout. Its a 3 laner, measuring roughly 6x12ft. 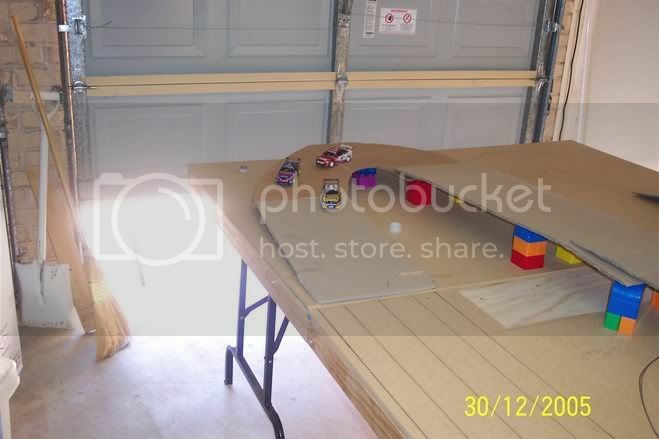 It breaks down to 3 tables of 6x4ft.I don't have the luxury of heaps of space, so this was the best I could hope for. 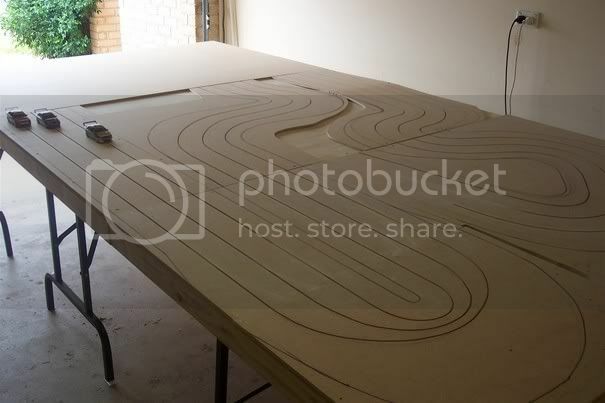 As I built the tables, it did look rather large. 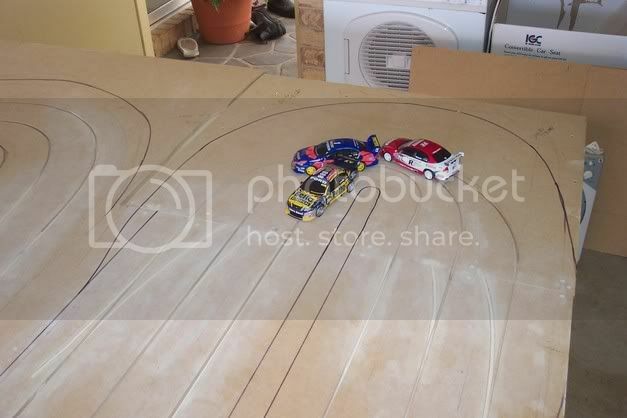 However once I started on the track itself and put some cars on the fleshed out road, well I'll be lucky if the main straight is 9 1/2ft. 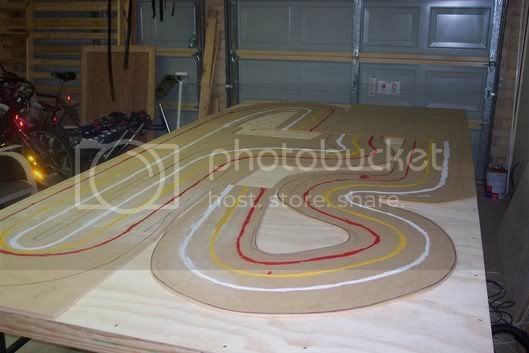 Anyway, the centre section is basically complete from a track construction point of view. One end section is almost complete, and I haven't started on the other. A general overview, apologies for the lighting. The last shot shows the blank MDf sheet at the end, and its just that, a blank 'canvas' if you will. 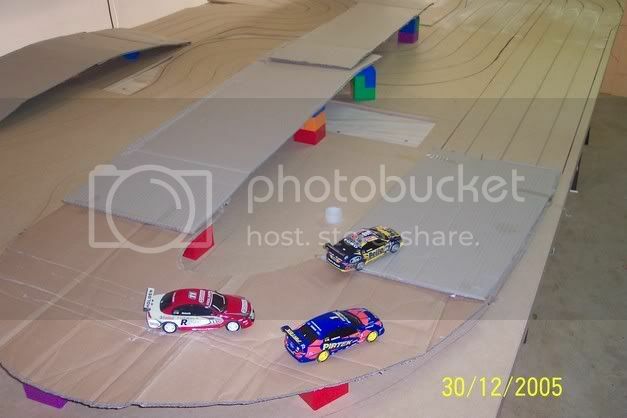 What I had in mind was for (I'll try to explain as best as I can) the bridge, roughly in the centre of the sheet to come down 90 deg to the left, then form a kind of sweeper onto the main straight. The 'ess' under the bridge would continue straight and basically mirror the turn 1 hairpin (with or without squeeze?). 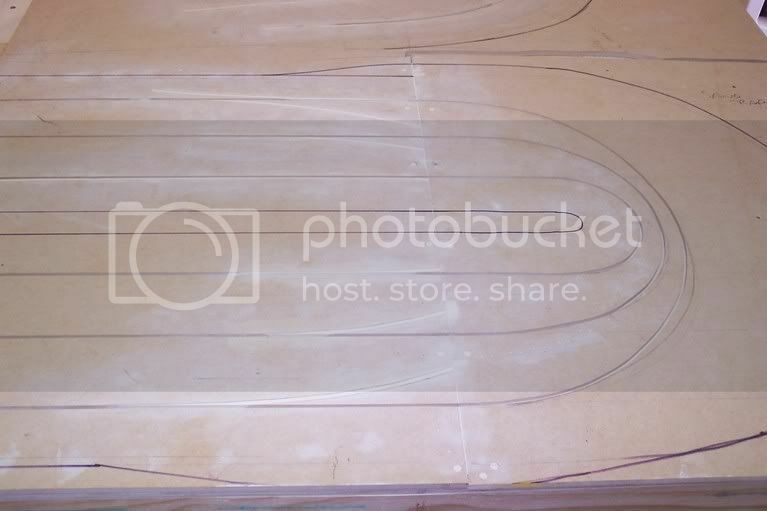 This gives a true 'figure 8', with the outer lanes having equal time on the outside. But looking at the photo gave me another idea. 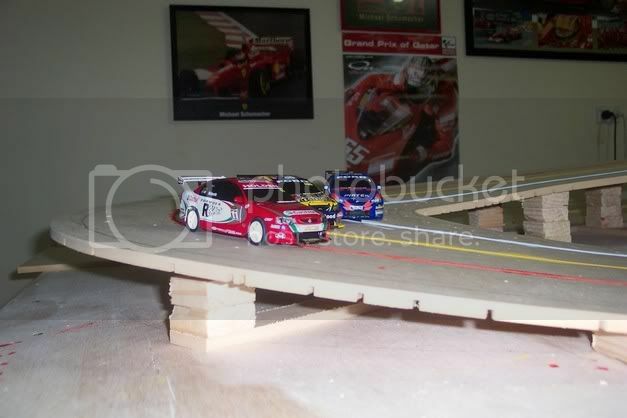 The bridge could go right and join the under bridge 'ess', while the the section closest to garage wall would go around and join to the front straight. I hope that made sense! I probably won't get a start on the last section till the new year, anytime that I do get in there will be to finish off the almost finished end, and to fix the tables. The floor isn't exactly level and its really noticeble on the blank end! PS I hope the photos work! Edited by gazza, 01 June 2009 - 08:28 AM. Umm... the photos work but are overly large. What do I do to remedy this?? I fixed the problem. Resized the photos on the host. Good work so far Mr Schu. 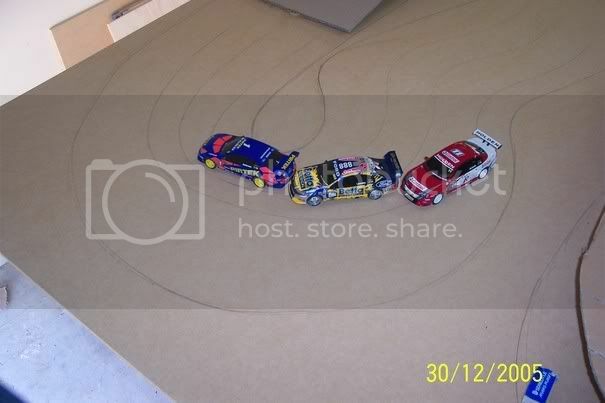 Just one question, how tight is the inside on the hairpin. It looks like it could be a bit of a challange to get through that one!! 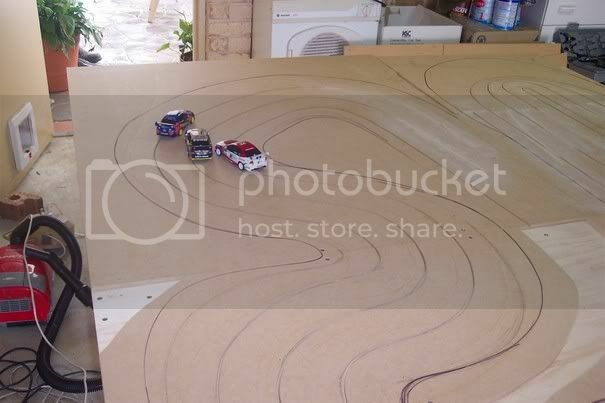 Love that hairpin, makes the corner a challenge just like the real thing. The hairpin is tight but it's roughly equal to a Scaley R1, IIRC. Anyway, it was alot tighter first time through. 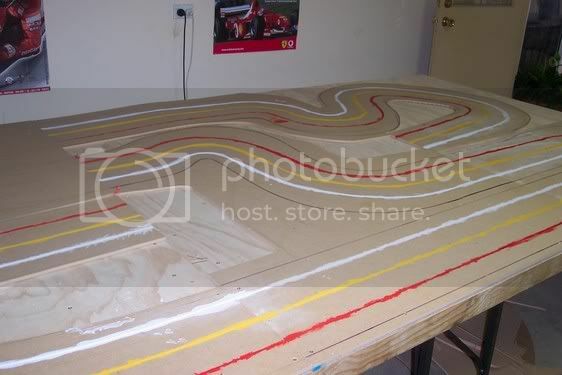 well done sch, hairpin looks like the one onmy track. god choice, you will love it. 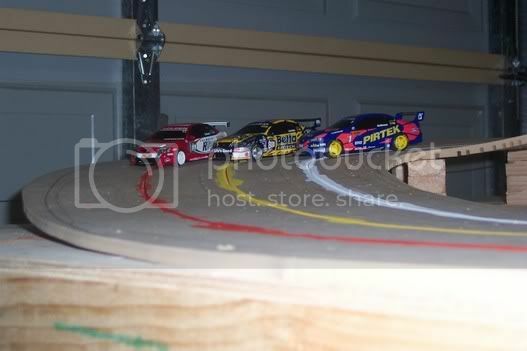 The cars close in on each other, just like the real thing. 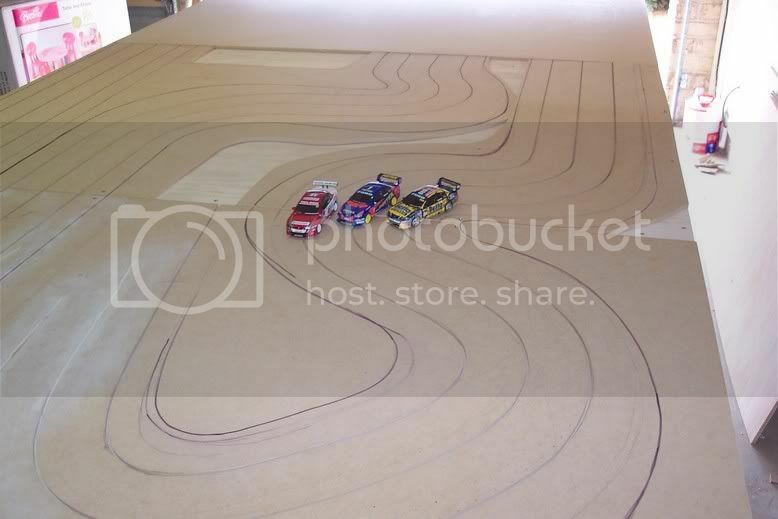 Looks like it will be a very interesting track. As you now know if you don't like the corner you ban always fill and re route it! Please keep the pics coming as it progresses. I just spent 40min out in the garage. Couldn't be bothered separating the tables to finish the first end section, plus it was hot enough as it is without powertools turning. So, since my ten month old was asleep, I decided tp grab her Lego Duplo, scissors and and cardboard and figure out the last section of track. As I mentioned earlier, I was in two frames of mind about the layout of the last end. This is what I came up with. 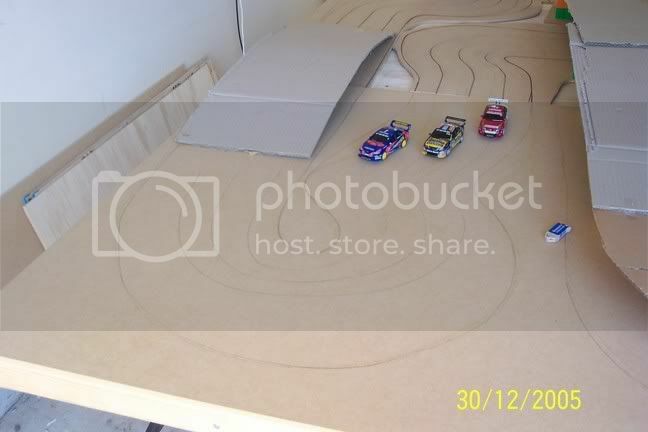 It was my original idea, but the far corner has a little 'wiggle' leading into a quasi-hairpin. Lead up to 180deg right hander. The hill on left of shot may or may not go in. Fleshing it out this way also gives an idea of visibility. The only obstruction I may have would be the chicane in the top right of this shot. I may just have to keep this end of the uphill a bit lower, and increase the height on the centre section. Edited by schuey19, 30 December 2005 - 02:18 PM. 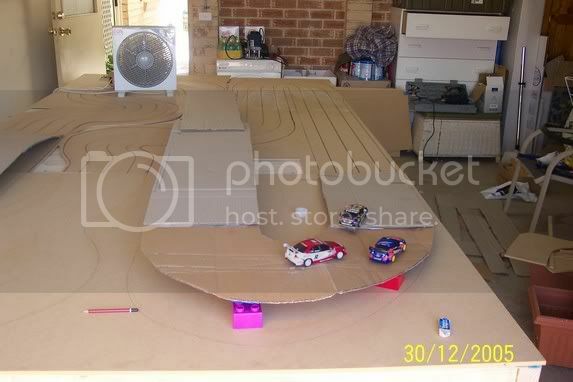 Did you use the cardboard technique for the other sections? 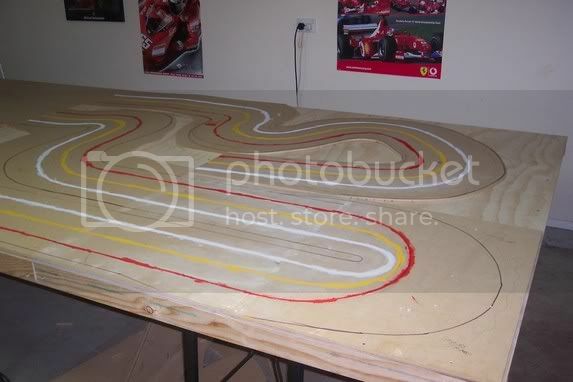 thats looks like its gunna be a sweet and challenging track. keep up the good work. No, but I had every intention to. That was the reason I kept the removal boxes after our move 2yrs ago. But since I've been waiting over 2yrs to actually build it, well when the time finally came to start 5 weeks ago, I wasn't stuffin' around with cardboard and tape! I do believe it does have its advantages though. 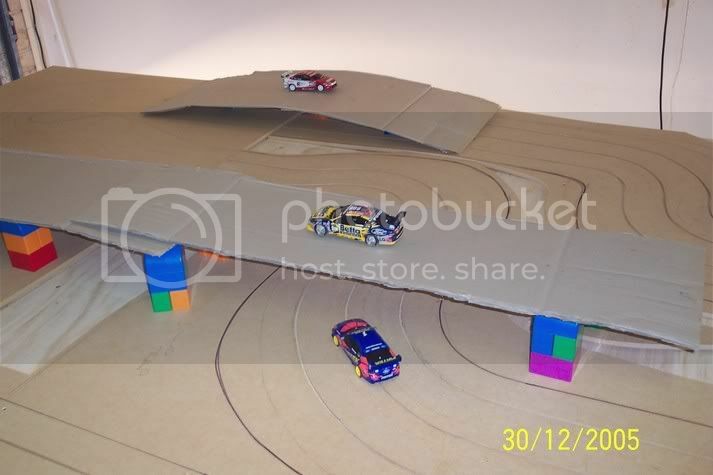 The visibility thing, and even though I had about a dozen different layouts drawn to scale on A3 paper, the cardboard actually shows how it would flesh out, without the expense of wasted MDF and a tonne of putty. Edited by schuey19, 31 December 2005 - 01:13 PM. The change to the hairpin was good also. 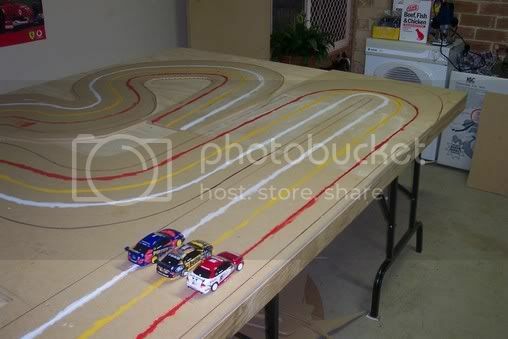 I have one of these on my track and it is very interesting when all the cars arrive at the corner. I like the hump in the back straight as any elevation changes really change the way the track drives. Who says we cant play with lego??? 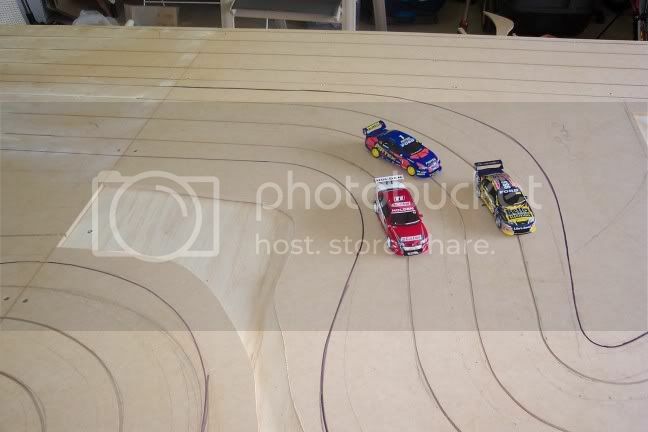 Just shows how a few elevations give the track a completely different look. After a two week period of tools down, I managed to get a bit done the last two days. The lead on and lead off to the bridge section are routed, cut out and under cut, now just await elevating. I have only six more slots to rout, and that is all the dirty work done! Its only a short run to the first corner! This will be a down hill sweeper leading on to the short start/finish straight. Painting the slot is one of the best things you can do I reckon. 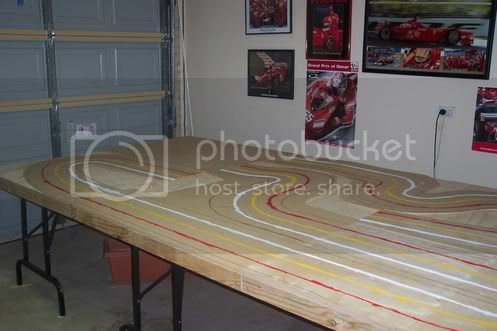 A question for those with wooden wonders, or any track for that matter. 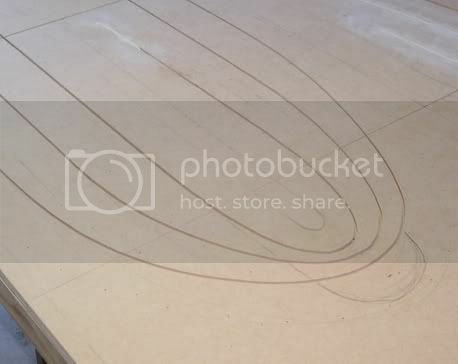 Is it necessary to have a degree of camber on corners, especially those on an incline? Was out playing with the bridge sections earlier tonight, seeing what height looks and would work best. In this picture, it is obvious how much the road falls away towards the outside. Should I raise the outside wrt the inside of the corner? Edited by schuey19, 17 January 2006 - 08:45 PM. Looking Good Michael. 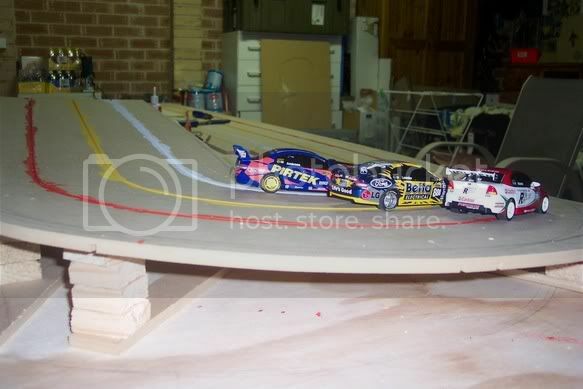 I dont think the camber is necessary but it works nicely on one or two corners just for a bit of a change and maybe a nice fast corner. From my experience, negative camber can really catch out people. I have noticed in the slot game, it doesn't take much negative camber at all. 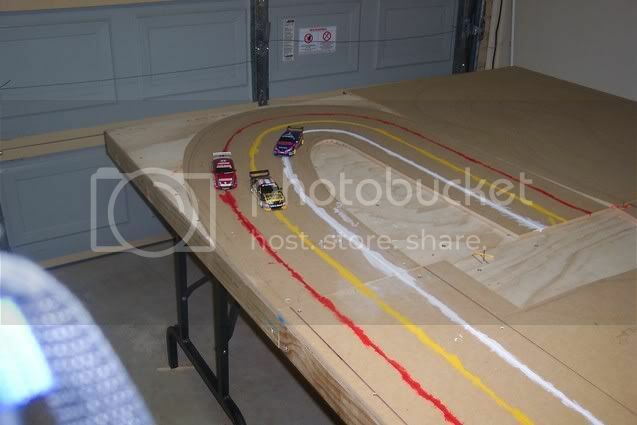 But that being said, its going to be the same for everyone racing on that track, so if it catches people out, they will just have to learn to slow down more!! !